Originally published: New York: Atria Paperbacks. SOMETIMES THE ONE WHO LOVES YOU IS THE ONE WHO HURTS YOU THE MOST. Lily hasn't always had it easy, but that's never stopped her from working hard for the life she wants. She's come a long way from the small town in Maine where she grew up - she graduated from college, moved to Boston, and started her own business. So when she feels a spark with a gorgeous neurosurgeon named Ryle Kincaid, everything in Lily's life suddenly seems almost too good to be true. Ryle is assertive, stubborn, maybe even a little arrogant. He's also sensitive, brilliant, and has a total soft spot for Lily, but Ryle's complete aversion to relationships is disturbing. As questions about her new relationship overwhelm her, so do thoughts of Atlas Corrigan - her first love and a link to the past she left behind. He was her kindred spirit, her protector. When Atlas suddenly reappears, everything Lily has built with Ryle is threatened. With this bold and deeply personal novel, Colleen Hoover delivers a heart-wrenching story that breaks exciting new ground for her as a writer. 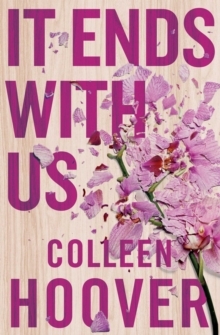 It Ends With Us is an unforgettable tale of love that comes at the ultimate price.